In this two part interview, we speak with Wassim Haroun of CONSER, the firm that constructed Xumboweyne dam and is currently working on the Berbera Corridor project. We discuss the dam’s current state and much much more. Somaliland Chronicle: Mr Haroun could you tell us more about yourself and your firm CONSER? Wassim Haroun: CONSER is an engineering firm that was started in 1969 in the UAE and then officially re-registered in 1972 when the UAE was formally established. As consultants and over the span of almost 50 years in the Arabian Gulf region, the company had designed and supervised a multitude of projects spanning infrastructure, buildings and towers, bridges and roads, dams and canals, and a slew of transportation projects of all forms. Somaliland Chronicle: What are some of the projects you and CONSER have implemented in recent years, your career highlights so to speak. Wassim Haroun: At CONSER we have re-focused on our infrastructure and water heritage,and as such over the last decade, we started a huge drive to re-emerge as oneof the leading regional firms in these fields. As such lately in the UAE we have finalized the design and are in the process of supervising one of the largest and complicated road projects in the Emirate of Fujairah (called the E99 road) as well as a number of medium sized various infrastructure projects. In Oman we are also in the closing stages of supervising a number of road and highway projects that we had designed. In Somaliland, we concluded the defect and liability period on the Xumboweyne dam – the largest concrete structure in the Somaliland, and we are in the process of the design portion of the rehabilitation of the Berbera to Tog Wajaleh road. Specifically when you ask about career highlights I wish to note that CONSER is a company with numerous associates and senior engineers, we are not a one man outfit, we believe in specialized engineers to suit each solution. The overall highlight of all our operation sis that we are true to one thing at the end, we are caretakers of the clients trust, and we will do our utmost to deliver the best value for money. Somaliland Chronicle: Somaliland is lacking critical infrastructure to get it on the path to lasting and tangible development. The expansion of the port is a huge step in this direction. As an engineer who has worked all over the world, what do you see the most pressing infrastructural need that Somaliland should focus on? Wassim Haroun: Before I answer your question specifically let me tell you what my outlook is for Somaliland. Somalilands’ lack of infrastructure – although apparent –needs to be a complementary part of an overall master plan where infrastructure is an enabler not a goal. The basics are naturally all required, but it is vital to address the requirements with a wholly unique approach for Somaliland, and not just copy what has been done in other places just because it is the norm. Every country has a unique set of circumstances and requirements,and this is exactly what needs to be done in Somaliland. Once the masterplan (the economic development masterplan that is) is done and PUBLISHED then it becomes easy to justify not only one project but a 20 year plan as then you would be able to prepare an economic sustainable approach to all your expenditure. Also Somaliland has a unique advantage that needs to be capitalized upon, and that is the fact that it has a clean canvas to work with and no burden of a dated infrastructure debt. De-facto Somaliland can approach its needs with an outlook of leap-frogging the world in terms of technology and applications and instead of applying conservative old technologies from the last century is to begin investing in tomorrow’s solutions. As an example let us look at roads – for which Somaliland has an acute need for – the first question that should be asked is WHY. Naturally transportation is the answer, people, goods, livestock etc.. But are roads the only answer?What is the projected traffic? Can we solve it with mass transit or even more adventurous technologies. Back to specifics, yes there are acute needs that all need to be addressed within the framework of the economic development of all regions, but I would start with Water (potable and agricultural – with a focus on smaller towns and villages first and not just the capital) then Energy(again rural first), then transportation for economic clusters – which should naturally develop once the basics of water and energy are put in place. Overall the focus should be on the development of economic and life clusters outside the capital as that would bring the cost of infrastructure per capita lower. 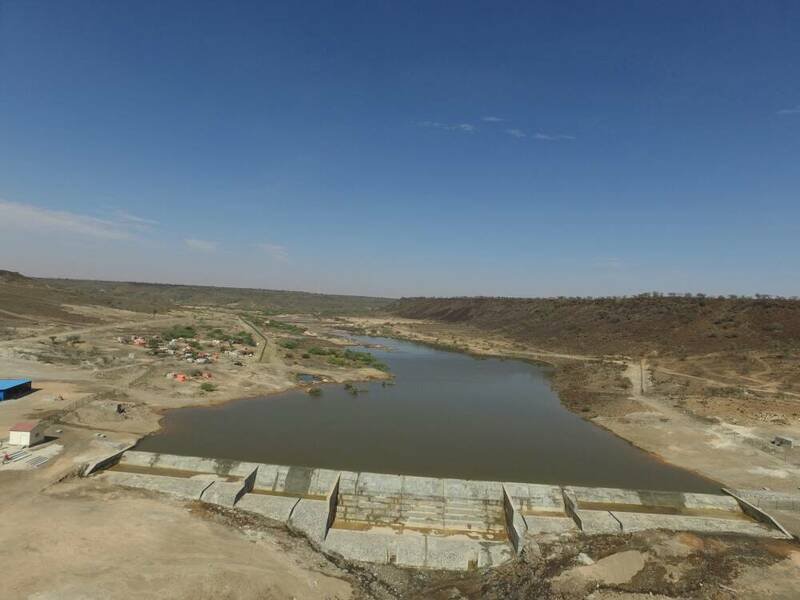 Somaliland Chronicle: We want to talk to you about Xumboweyne dam to understand what state it is in. Basically there is a lot of information about it out there but we want to hear it from you. Tell us as much as you can about Xumboweyne dam and How was the site of the dam chosen, were any feasibility studies conducted to ensure it was the most appropriate location for the construction of the dam? Haroun Wassim: Allow me first to give the background and history. There was a promise made by His Highness Shaikh Mansour Bin Zayed – Minister of Presidential Affairs in the UAE to build 5 dams in Somaliland. At the early stages of the investigations that were made by the ministry of water, and through the collaboration with the UAE government represented by Khalifa foundation, the SL government put forward many sites for the potential 5 dams,we were engaged at that time to assess all of them including locations such as Berbera, Laas Canoud, Adi Adiye, Burco & Waheen. All locations were jointly visited with members of the Ministry of Water back in 2014. Subsequent to the visits, and the initial report, a decision was made by our clients to start with Waheen (Despite our report clearly mentioning that Waheen would not be economically feasible AT ALL. Never the less, we were engaged to proceed. When we started mobilizing for more detailed studies, we were able to convince the client that Waheen was highly problematic – in FULL COORDINATION AND AGREEMENT WITH THE MINISTRY OF WATER IN SL. The client requested an alternative on condition that it does not exceed the allocated budget. At that point in time The Ministry personnel asked us to look at the Xumboweyne area as the preferred area for a dam. We subsequently visited many sites along the wadi and finally agreed on the current location due to its geological advantages of being on a mass of totally impervious Basalt. It was agreed, and we proceeded with further studies all on the basis of the location being chosen by the ministry. Upon completing the detailed studies, it was concluded that it would be a massive concrete structure (to withstand the enormous flow forces) and the size and height were allocated with adherence to the budget as required. Also in the process of the initial design report and before any construction, we clearly stated 3 critical issues: The first is that there are no population centers in the immediate vicinity, and for the dam to be a success there needs to be a follow up project for using the water from the dam (moving forward in the timeline, and beyond our scope at the time, we presented many ideas to the heads of the local community as well as to the various ministers and business people, for how this dam could be capitalized upon and return huge benefits and profits). The second is that the dam will need periodic maintenance from siltation as it will totally be filled with sediment every 2 years (For this issue too, we provided a full economic study of how the silt could be used productively and economically to basically pay for the periodic maintenance). And thirdly that the DAM IN NO WAY WOULD SERVE TO RECHARGE THE DEEP WATER TABLE THAT THE XUMBOWEYNE WELLS TAP INTO. Based on the report, both the ministry and the UAE government approved and instructed us to move from the design phase to the construction phase. 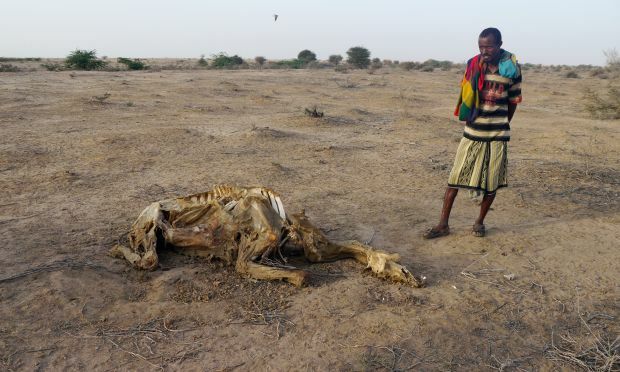 Somaliland Chronicle: As you know, water is a major problem in Somaliland, which is hampering many aspects of development including agriculture and food security. Xumboweyne dam was intended to relieve some of the water shortages in the area. What was your role in the dam construction? 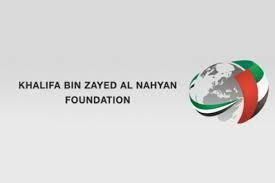 Haroun Wassim: CONSER was appointed by Khalifa bin Zayed Foundation for Charitable Works to deliver a Turnkey Dam project, from design to construction management. Somaliland Chronicle: Did you and your firm CONSER implement projects of this type in the past or was this your firm dam project? Haroun Wassim: YES, many. CONSER has one of the largest portfolio in the southern hemisphere in terms of dam design in arid or semi-arid areas. Our experience spans 40 years in this field with a little over 150 dams designed and executed. 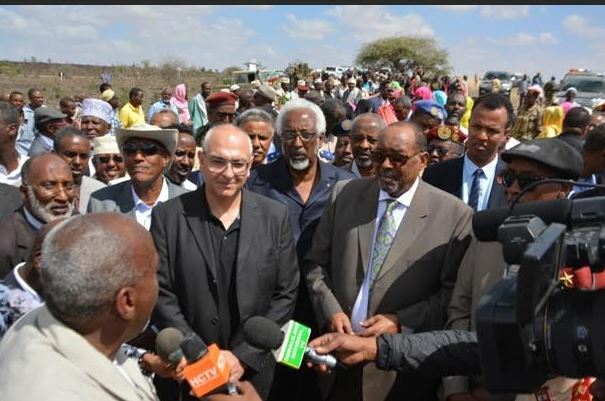 Current Somaliland President HE Muse Bihi Abdi (second from left) with Wassim Haroun (center) and Former President Siilaanyo (second from right) at Xumboweyne dam. 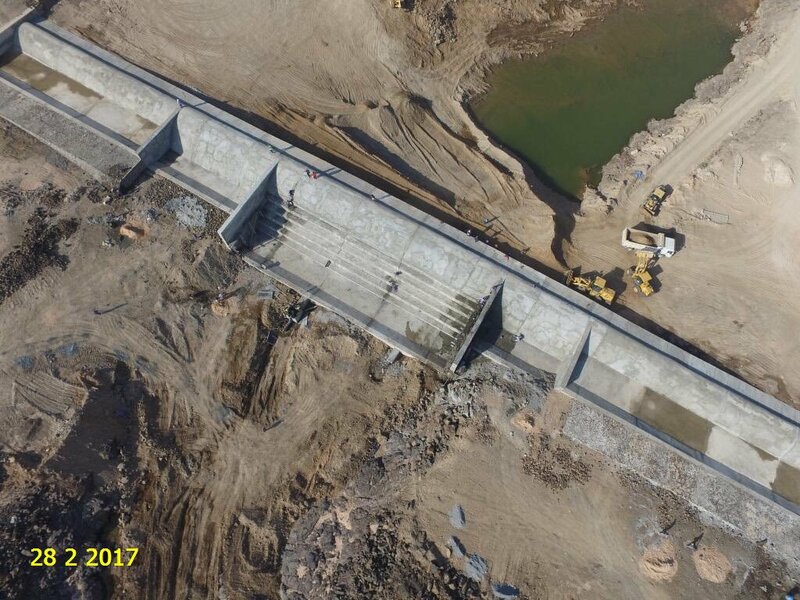 Somaliland Chronicle: The previous administration of Somaliland has hailed the construction of the dam an astounding success, while the current Minister of Water Resources called it a total failure. What is the dam’s current status? And is it serving its intended purpose? Haroun Wassim: Political jockeying aside, the dam was designed and built exactly to the requirements that were made to us at the time and according to the study report that was approved. The purpose of the dam was expressed clearly in the early stages of the studies that were made, it was to be a surface water reservoir AND a block (dam) for the alluvial water that escapes in the sand layer in the Xumboweyne wadi to be used for pastoral irrigation and farming in the local vicinity. Somaliland Chronicle: Success can be subjective; do you personally consider the dam to be a success? Haroun Wassim: NO, a project is only successful if it is used. With no one using the dam it cannot be deemed a success. That is why 4 months prior to completion we proposed at least 3 possible uses and subsequent investment projects that could be made to capitalize on the dam. Our proposals were initially met with excitement and then a standard response “THAT WOULD BE GREAT, PLEASE TELL THE UAE GOVERNMENT TO MAKE IT FOR US”…. One of the projects was about to be secured from yet another donor in the UAE with a whole farming village to be built on the upper banks near the dam, the funding stopped once the vile rhetoric started as part of the political campaigns. Somaliland Chronicle: When you were working on the Xumboweyne dam, was there any corruption and did you and CONCER experience what you may consider shakedown from Government officials or local community? Haroun Wassim: Although the Xumboweyne dam project was potentially open to corrupt activities, altogether the support at the time from the Abudhabi government, the Somaliland government officials and the community elders was one where the main driver was the smooth success of the construction of the dam. If there were any demands made at all, they were justified by services that aided in informing the immediate public of the potential benefits that they would have and again ensuring that work could proceed. The simple answer is that from petty attempts that were rebutted by myself and my staff there were no corrupt activities that in any way threatened the integrity of the project. 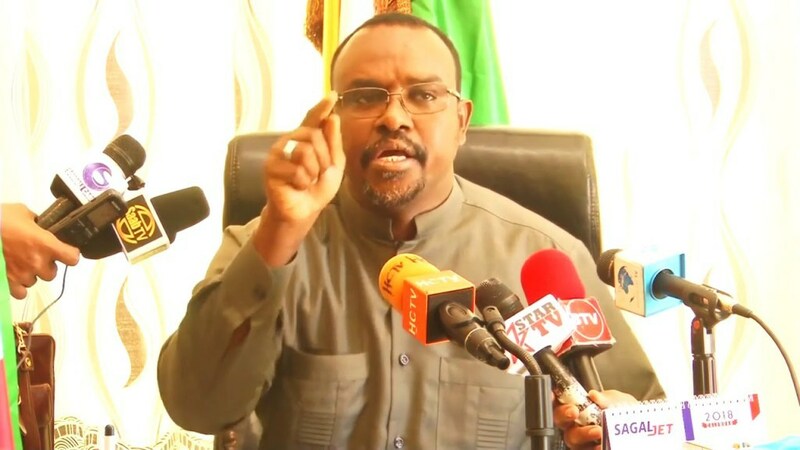 Somaliland Chronicle: The Hargeisa Water Agency is currently working water sources expansion project but their plans does not include Xumboweyne Dam, why is that? Haroun Wassim: I have gone on record many times in saying that it is not economically feasible to bring water from a lower elevation to satisfy the need of cities in higher elevations, especially when the source of the water comes from the higher areas. To pump water from Xumboweyne area (850 m above sea level) to Hargeisa (1,300 m above sea level) would mean spending $16,000 per day in pumping costs to satisfy the needs of only one quarter of Hargeisa. That translates to almost 6 million dollars a year. NOT GOOD (a Trump quote). One understands from the interview atleast that Xumboweyne Dam and its water is not to be used in Hargeisa as that is not good from an engineering standpoint. Good then we can stop talking about the dam in connection to Hargeisa water supply. How can we then use the dam? For argricultural purposes(beeraha degaanada ku dhow) ? We need to be solution oriented and talk about what is possible and then do it. Too much money and work went into this project for it to go to waste. Come on reer Somaliland lets fix Xumboweyne Dam and make use of its water. If we can build more than 300km of road from Burco to Erigabo then we can do anything. If us Qurbajoog understand this issue we can work to solve it. So please help us understand WHO is the problem that is stopping the projects success. 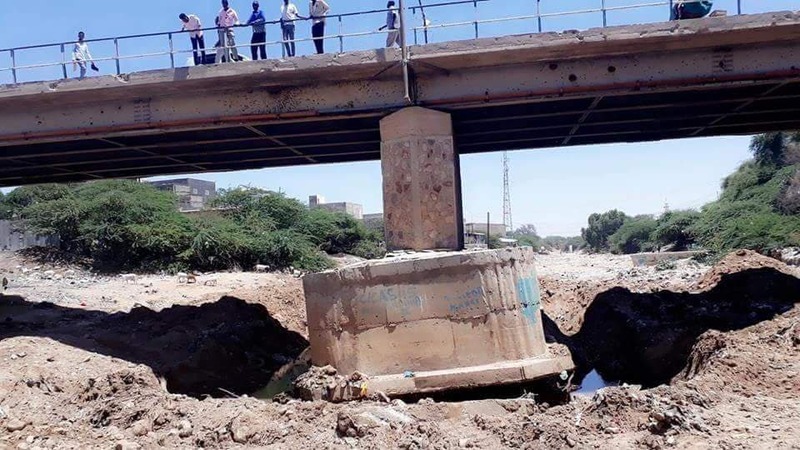 I think Mr. Wassim Haroun should sit down with Somalilland’s president, Finance Minister, Planning Minister, Agricultural Minister and Water Minister so a plan of action can be made on how to fix, complete and make this project a success. Identify the problem(s), identify possible solutions, lets pick a solution or solutions, lets come up with funding plans, lets make the project happen. We the Somaliland Diaspora are willing to help in anyway we can not the least financially.